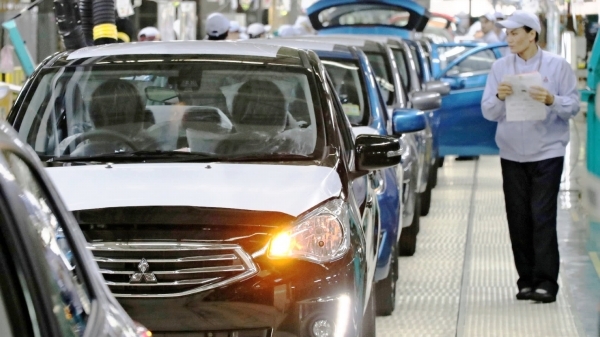 BANGKOK -- Thailand produced more than 2 million automobiles last year, surpassing that mark for the first time since 2013 thanks to a rebound in domestic demand. Production volume rose 9% to 2,167,694 units in 2018, according to the Federation of Thai Industries. Output for the domestic market jumped 19% to 1,024,961 vehicles, while exports edged up 1% to 1,142,733. Thailand, known as the "Detroit of Asia," typically exports more than half of its auto output to other markets. Demand in the country benefited from the consumers who took advantage of a 2012 car-buying incentive and fulfilled the requirement to keep the vehicle for five years. Economic stimulus aimed at helping low-income consumers also helped, the industry group said.